Desperados Wanted Dead or Alive is an Action and Strategy game for PC published by Nordic Games in 2001. It is the year 1881 in the west. A western city named El Paso is the place that you live inside. The railroads have become to this wild west city. But no one can guarantee its security. The bandidos rob most of the trains on the railroads. The company of the trains has offered fifteen thousands dollars for who catches the robbers. But no one has the courage to do this. Because the robbers’ band has wild members! They do anything for money. And no one is important for them. They just live to kill or to be killed. At this terrible situation, You decide to disband all the members of this western group. It seems impossible. But you try hard for it. The players will take the roll of a cowboy named John Cooper. You have to create a crew of the old partners instead of him. There are more than twenty kinds of enemies at Desperados Wanted Dead or Alive. You may meet some of them in an unique level. Each enemy has skills at some fields. Before you fight, It’s necessary to discover their abilities. 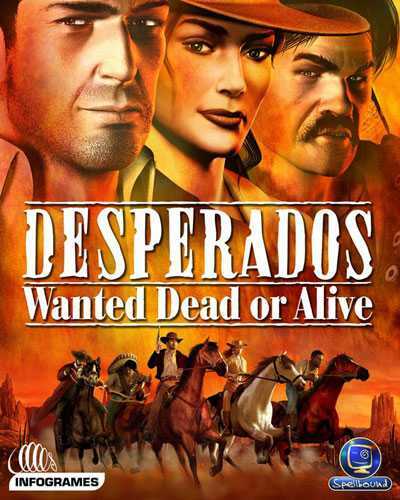 There are also twenty five levels in total for Desperados Wanted or Alive. It means that the player experiences a challenging story in the west. Although this action strategy game doesn’t have great graphics, The gameplay is awesome! The players’ average rating in metacritic is 8/8/10. Which means a great game with lots of enjoyable properties. If you have also tried it some years ago, It would be nostalgic to try it again. 14 Comments ON " Desperados Wanted Dead or Alive Download "
I PRESS INSTALL but theres no pop up screen show it is intaliing…is this normal ?